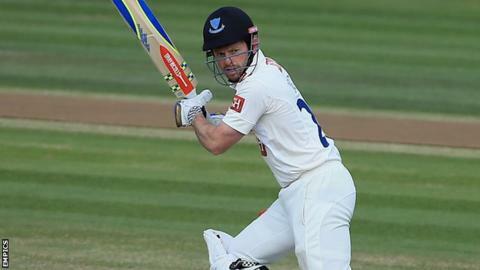 Ed Joyce has stepped down as Sussex captain following relegation from County Championship Division One. The 37-year-old Ireland batsman has skippered the Hove side for the last three and a half seasons. "The time is right to hand over the reins to a new captain and whoever that is will have my support," he said. "My increasing commitments with Ireland and the stage in my career I'm at meant that the job became more a burden than a challenge to be relished this year." Joyce took over the Sussex captaincy in the middle of 2012, replacing Michael Yardy. The top-order batsman led the side in the County Championship and One-Day Cup this year, with Luke Wright skippering the side in the T20 Blast. Joyce scored 786 first-class runs at an average of 31.44 as Sussex's five-year stay in the top flight came to an end. "We've had a very tough year in 2015 but despite this, we've received overwhelming support from the majority of fans," Joyce added. "I'm very determined to get back to scoring lots of runs and helping us back into the first division of the Championship. "We have so much talent in the dressing room and so many good people throughout the club that I'm certain we'll bounce straight back from this season." Meanwhile, Sussex bowlers George Garton and Matt Hobden have been selected to take part in the Potential England Performance Programme this winter.